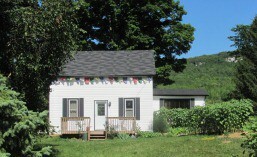 The Village Retreat House is at 235335 Grey County Road 13 in Kimberley, west of Collingwood and the Blue Mountains. The house is just over two hours from Toronto, and one and a half hours from Guelph. Take Highway 10 to Flesherton. Turn right on Country Road 4, and then after about 5 km, turn left on Grey Road 13 and drive north about 10 km, past the hamlet of Eugenia. Grey Road 13 passes right through Kimberley.